Went back to the jetty this morning around 7am. Tide was on the way up. Setup two set of tackle and casted out. Add on cable car rig when live bait available. Nothing happen until tide was full and started to turn down. I was winding back one of the rod to change bait when my other rod torium alarm went off. Ah An was close by and he pickup the rod and strike. I took over and the fish make a acrobatic jump on the water surface. Knowing it was a queen fish, I told An no need to prepare gaff as the water was high. I bring it close and An use his hand to grab my leader to lift it up. It weigh about near to two kg. While I started to fillet the queen fish, suddenly I hear them shouting “oh tio tio tio” and my Daiwa Emblem reel go “Zzzz zzzz”. Ah An again the first one to reach and strike. As my hand is dirty with blood now, I ask An to fight. He fought for awhile and told me he not use to my right handle spinning reel. Haha…no choice I had to wash hand and take over. Now the fish has follow the current flow and moving to my left. I had to bring the rod and cross over two rod parking high up before I able to pump the rod again. It didn’t struggle much as I manage to bring it close. Upon surface…”Wow” the crowd that watching gave a good shout as they saw a fat grouper on the water. Ah An bring in his gaff and lift it up. 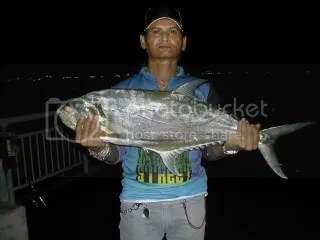 It weigh 2.4kg just 0.1kg short of even my personnal best on grouper on surfcasting. The tide is up coming so went for a short trip. Setup to sets of tackles and landed this palm size red snapper. I was sitting on the stone bench just beside the rod when it took my bait. I can hear my spinning reel has a light screech and my rod tip shake. I strike straight away by holding the rod on one hand and the other hand press on the spool to avoid the drag slip. If without pressing the spool it may cause the drag to slip and it soften the strike force to set the hook or delay striking by tightening the spool first might have lost the fish. Any fixed spool user need to have this knowledge. It was already 2am and the tide is turning down. Siong reel alarm was the first to sound. I shouted for him to strike. However he fumble at his drag and didn’t strike. He suddenly pass the rod to me and say he dare not fight and ask me to do on his behalf. I strike straight away and it was on. Gary who fish at another corner come over to look. Suddenly some one shouted for him to go back. It was his reel alarm also sounded. Haha.. two fishes on at the same time. He rush over and White(another angler) already strike for him and pass him the rod. For my side, the fish started to swim inward. I had to speedup my winding to catchup with it. When near the jetty, it make a splash at the water surface then dive downward again. Then it stay deep for awhile before I over power it. It surface and now Siong already ready with his rope gaff. It turn out to be a stingray. By now Gary also landed his fish and it was a Queen fish. Back home early so went for a short trip. Reach there around 6.30pm. Tide has just turn up. Current not fast yet. Setup two tackle set and casted out with fresh tamban caught by Ah Meng who pass some to me. Bait was not lasting this evening..Has to change very often. Nothing happen and the current start to pickup fast. Near to 9pm…I feel abit hungry so start to make coffee and had a bread for a break. While munching my bread, I take alook at my rod and saw one of my rod tip shaking. It is not those shaking make by strong current flow but definitely is a fish taking the hook. Then I saw my line was carried away by the current flow. Bloody hell…I don’t eat U don’t eat. I eat U also start to eat…(inside my heart was scolding) No choice…quickly swallow down my bread and pickup the rod to strike. Yes…heavy at the end but no struggle. Must be a eel..(I thinking). Wind back it turn out to be a big mouth eel tail catfish. I used my rod to lift it up. It weigh at 1.9kg. 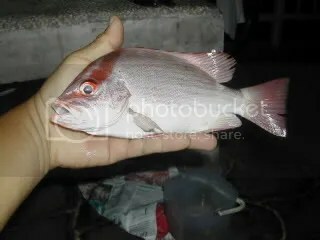 Call up one of my friend who love to eat this fish and pass it to him. He repay me by buying a ice cream with bread.